I am studying experiments testing local realism through the violation of Bell's inequality. In particular, I am trying to understand the setup of the so called loophole-free experiment carried out in 2015 (Ref: M. Giustina et al., Phys. Rev. Lett. 115, 250401 (2015)). The photon arrives at the polarizer and it can pass, or not, with a probability deending on its polarization state and predictable with quantum mechanics. The detector is there only to count the times the photon passes the polarizer. This is clearly an idealization and must be translated in a true experimental setup. The photon first meets an half-wave plate, so its polarization is rotated of 90°. Then, an electro optical modulator which is used to choose the direction of polarization measurement. 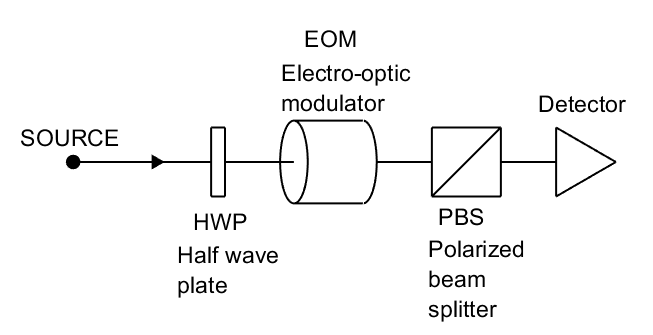 Finally, a polarized beam splitter, in which one of the two output channels is closed, while in the other a detector waits. What I think to have understood until now is this: in a setup like the first picture, the polarizer's orientation is changed when choosing a specific measurement, while the approaching photon polarization is fixed. In the second picture, instead, the polarization of the photon is modified through the EOM, while the PBS is clearly fixed. The two methods should give the same results. Now my questions: did I understand the functioning of the setup correctly? And if it is so, what is the function of the HWP (Half-wave plate)? Furthermore, there is one more complication. In the other measuring station, the other entangled photon faces the same setup, also its polarization is changed, but of a different angle. How can entanglement be preserved in this way? Using a polarizing beam splitter instead of a linear polarizer allows you to do a projective measurement on both polarization outcomes instead of discarding one of the two. More importantly, the second configuration allows you to choose which angle you want to measure by re-tuning the voltages on the electro-optical modulator, instead of by mechanically moving a polarizer. In loophole-free Bell-inequality measurements, time is of the essence (as you need to pull off the entire protocol in spacelike-separated events) and mechanical changes are just too slow. Instead, you use the HWP-plus-EOM combination, which is much faster. In the other measuring station, the other entangled photon faces the same setup, also its polarization is changed, but of a different angle. How can entanglement be preserved in this way? that's not a a concern. Local unitaries do not destroy entanglement, so long as they are strictly controlled and you know exactly what their effect is. They will change which precise entangled state you have, but they will not reduce the amount of entanglement. Not the answer you're looking for? Browse other questions tagged quantum-mechanics optics experimental-physics photons bells-inequality or ask your own question. Does the passage of time effect a photons entanglement with another? Was the phase randomized in this particular CHSH test (M. A. Rowe and others)? Which direction does half-wave plate rotate field? Photon qubits - does photon entanglement hold for detecting polarizations? If measurement of state of a photon yields some result R1 out of some mixed states then R1 is likely be the result just after the measurement?